SWIM. 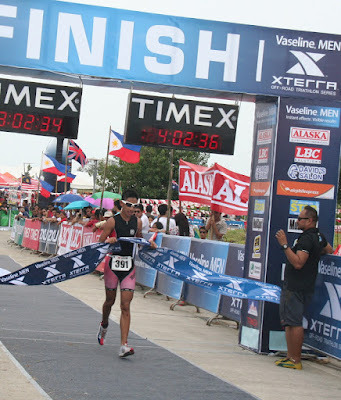 16-year old Luis Miguel "Igimax" Maximo (left), the youngest participant of the Xterra Tri, with good friend & fellow Cebuano actor Matteo Guidicelli, prior to the start of the 500meter swim leg. SWIM. Finishing the 500meter open water swim in 10minutes using a Santini TriSuit with a Twist Gel technology. TRANSITION. Shifting his focus from swim to the 35km bike leg. BIKE. Negotiating the "Graveyard" downhill route wit his reliable and tough Kenda Nexcavator off-road tires. BIKE. The tough and very technical course resulted in some crashing down the hill and others opting to dismount on their bikes to get past the downhill route. FINISH. The junior road cyclist completing his first-ever triathlon event in 3hrs 2mins 34secs.